The infamous routine walk through....! An essential part of pre display preparation as every flight and every location is unique with different topography, site orientation, wind vectors etc. The pilots walk through the routine in detail to ensure that they each know exactly where they are supposed to be and to ensure that any conflicts are identified and resolved on the ground rather than at a critical point in the air! Gordon was trained on Chipmunks by the RAF in the University Air Squadron and then he was selected for the BEA/BOAC Training scheme for graduates at Oxford and went on to fly professionally for 32 years as a commercial pilot with British Airways. Gordon flew the Hawker Siddeley Trident, BAC 1-11, Boeing 757, 767 and retired when on the 747-400 with in excess of 15,000 hrs. He has also flown lots of aerobatic aircraft and has been involved with the Bucker Jungmann and Jungmeister at White Waltham since mid 1980's. 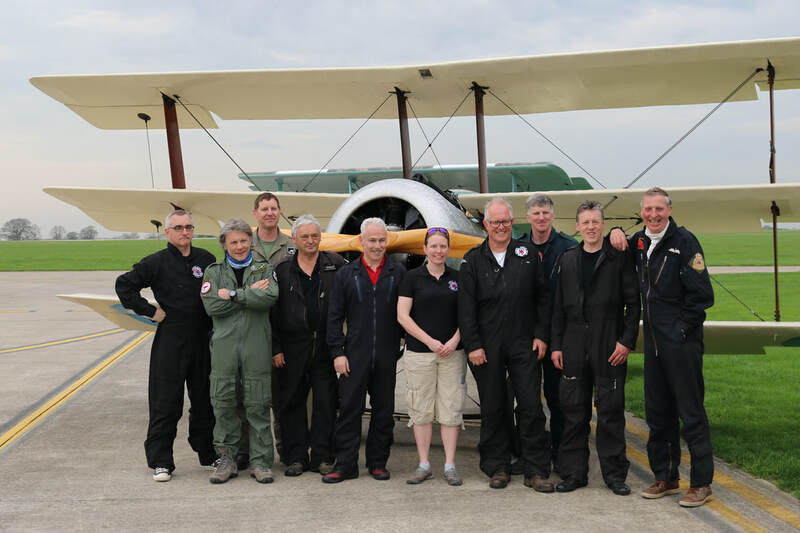 Gordon joined the team in 2007 and subsequently had a brain fade when he bought the Sopith Triplane and rebuilt it with John Day in 2010. He has flown it in displays since 2010 when he also became Team Leader after making a mistake by leaving the meeting whilst the vote was taking place. ​Dave got his PPL in 1965 and joined the RAF 2 years later, training on Jet Provost,Gnat and Hunter aircraft. He subsequently flew Harriers for 14 years before retiring in 1985 as a Squadron Leader AFC. Dave then joined FRADU flying Hunters ,Hawks and Canberras based at Yeovilton and spent 10 years carrying out mock training attacks on RN ships...mostly at 50' and 500kts. In 1995 he joined FR at Bournemouth flying Dassault Falcons flying similar missions in places as far apart as Bermuda and Oman. He retired from jet flying in 2007 but has continued flying with the Team which he joined in 2008 with his SE5a replica. He is the current Lead Pilot and has amassed over 12000 flying hours. Following a few early lessons in both gliders and aeroplanes, Emily started her licence in earnest in 2001, as the recipient of a flying scholarship. She joined the University Gliding club to continue flying and has since been a gliding instructor, a tug pilot and learnt to fly aerobatics in both gliders and aeroplanes. She started flying in aerobatic competitions in 2007 and has been competing in powered aircraft since 2009, when she won the Standard National Championships. Emily is part of the British Aerobatics Team and in 2016 she became the British Advanced National Champion. She competes with husband Mike, in a Cap232, and, more recently, they have both branched out in to display flying with the Bremont Great War Team. 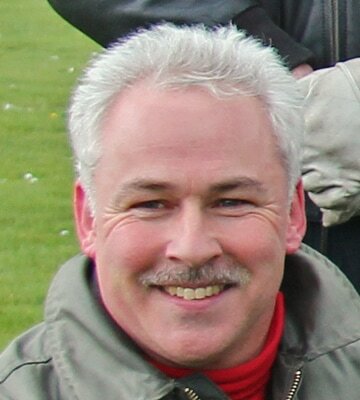 Mark was awarded a Flying Scholarship in 1983 and, after studying Mechanical and Design Engineering at college, worked as a flying instructor. Amongst other types he flew the Pitts S-2A extensively, teaching type conversions and aerobatics. In 1994 he joined British Midland and was on the final DC-9 conversion course, then flew the delightful Fokker 70 and 100, achieving his command in 1998. In 2004 he began flying the Airbus A.320 series and continued to fly the Airbus series with the merger of British Midland and BA in 2012. Mark flew with BA until retiring, knackered, in 2017, having visited 43 countries, 122 airfields and amassing 14,000 flying hours! Mark has owned and maintained a Tiger Moth since 2003 but with a great-uncle who served as a Captain in the Royal Flying Corps, aviation history and especially the aircraft of the Great War have always been Mark's passion. Mark has flown the Fokker DR.1, B.E.2c and Avro 504K and will be flying the Avro in the Team's Displays. Part of an aviation family, Matthew spent many hours flying with his father and two sisters in Tiger Moths, Stampes and Rapides including 4 up aero’s in a Stampe. Matthew was introduced to WW1 aviation at an early age with visits to the film sets where the films The Blue Max, Darling Lili ,and Von Richtofen and Brown were made . He went on to gain his PPL in 1986 flying Auster Aircraft and graduated to Tiger Moth and Chipmunks with the Barnstormers Flying circus whilst gaining his DA. Matthew's Display Authorisation unusually allows him to carry out Wing Walking and Limbo Flying to 3ft. In his 1400 odd hrs, nearly all on vintage Aircraft, Matthew has flown everything from a Luton Minor to a North American Harvard. He is also and Authorised Air Test Pilot by the CAA and both an LAE and Inspector for the LAA.In the Team he has flown the Fokker DR1 in displays but now mainly flies the BE2 Replica that was originally built by his father Charles and Uncle David for a film in the late 60’s. Matthew and Steve Slater acquired the Aircraft in 2005 and rebuilt it to flying condition. Mike started his flying career in gliders at Booker (where he essentially grew up). His time there included winning a National Championships and representing Great Britain in two World Championships. During this time he also spent a number of years as the Chief Flying Instructor of Booker Gliding Club. More recently he has transitioned to the noisier side of powered aerobatics, becoming the 2014 Intermediate National Aerobatic Champion and being part of the Silver Medal wining team in the World Intermediate Championships. He is currently a member of the Advanced British Aerobatic Team and along with partner Emily runs the aerobatic training school Ultimate Aerobatics based at White Waltham. Mike also flies commercially as a pilot on the Falcon business jet. Peter started flying at Biggin Hill in 1978 and shortly thereafter joined the Tiger Club at Redhill .After a spell as a flying instructor at Redhill and Blackbushe airfields, he gained his ATPL and in 1987 joined Air UK as a First Officer on the Fokker F27 followed by the BAe146. A taste for aerobatics soon led to ownership of a Pitts S1 in 1988 and then display work with the Pilatus P2. He gained his command in 1991 and flew as Captain on the Fokker F27 followed by the F100 & finally the Captain on the F70 for KLM Cityhopper, retiring in 2016. With a father who was a flight test engineer at Vickers Armstrong (now BAe) involved with everything from Varsitys to Valiants, VC10s and Concorde, Trevor has always had a keen interest in aviation and particularly flying. Trevor started as a glider pilot at Mendip Gliding Club and went on to gain his PPL with Staverton Flying School in his late 20’s. Since then Trevor has owned shares in various aircraft including a Chipmunk and now owns a 1947 ex Army Air Corp Auster T7 that he also displays. Whilst working for Air Atlantique Classic Flight for over ten years Trevor flew a large variety of aircraft, many of them iconic vintage types. Trevor has accumulated over 1000 hours and is a Class Rating Instructor and LAA coach. He particularly enjoys flying the replica SE5a in the Great War Display Team helping bring to life for airshow crowds the heroic exploits of the pilots from that era. Will learnt to fly at Shoreham in 1986, after progressing from gliders at 17yrs old. He has flown continually since then, mainly in vintage and tailwheel aircraft. Display flying came around after he gained his instructor rating in 2006, since then Will has flown in displays in the UK and Europe, ranging from vintage types to V-12 Warbirds. Alex began flying with the Royal Aircraft Establishment, Farnborough, gliding club when he started his apprenticeship there in 1983. He carried on gliding for the next 25 years becoming an instructor and tug pilot along the way before his growing interest in homebuilt and classic aircraft took over. Alex built his RV-4 and is currently rebuilding a Cosmic Wind. He began flying with the Great War Team in 2010 and has flown the Junkers CL1,Sopwith Triplane and more regularly the Fokker DR1 owned by Bruce Dickinson of Iron Maiden. He is a flying instructor and teaches aerobatics on the Pitts S2A for Ultimate Aerobatics and has also branched into film work flying an ME108. Alex is currently employed as an engineer by British Airways based at Heathrow. Dan joined the Royal Air Force at 18 and went to London University to study Aeronautical Engineering. Flying training began in 1984 on Jet Provosts and he gained his wings on the Hawk. After weapons training Dan flew operationally on Harriers at RAF Wittering and also at RAF Gutersloh in Germany gaining 1200 hours on type. In 1992 he was selected for the USAF Test Pilot course at Edwards Air Force Base and during the course flew 43 different types of aircraft ranging from the F-15 to the C5 Galaxy. After Edwards he was posted, to the Defence Research Agency at Bedford, and then to Boscombe Down. In 1996 Dan left the military to fly as a test pilot for the Civil Aviation Authority and was involved with the Certification of many types of aircraft ranging from the Airbus A380/330/340/320 family to lighter aircraft.Dan left the CAA in 2007 and now works as an independent test pilot, Training Pilot and businessman.